Orange juicy slices, sweet and succulent. The tangerine – there for the picking. 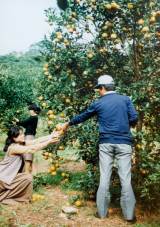 So we set off for Motobu, just to the left of the Cherry Blossom festivities, we ventured to find the fields of orange and to experience the flavor of the island during this season of the year. I write this article in hopes that you may benefit from my ignorance in the search for the nutritious Vitamin C.
The ride was nice, heading for Nago on 58 along the beautiful turquoise shoreline. Once we reached Motobu, we headed to the left and followed the peninsula past the ferry port to Ie and Yoron after passing multiple quarries that dot the coast. As we made our right turn around the point, we headed toward the tangerine-picking farms that graced the Northern sections of Motobu. We stopped around midway back to Nago and parked the car near a roadside neatly marked with a sign that displayed the sought after fruit with a neat arrow pointing left. 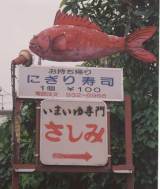 After giving the salesgirl the universal picking sign, she readily pointed to a white plastic bag and then pointed to the posted sign indicating the ¥250 yen price. I tucked my gray plastic bag recently received from purchases at Kadena into my daughter’s jacket. As long as they were supplying the bags for free, I figured that I could always save mine for something else. “ What a deal ”, we thought as we proceeded to grab two bags and head toward the dwarfed trees dripping with orange tangerines. At one point during the pick, we remarked about how inexpensive this ordeal was and commented on how they could remain in business with such great prices. Several families were sitting and eating tangerines for it was well known that you do not pay for any tangerines consumed during this adventure. In fact, this is where my extra bag came in quite handy. We observed an older lady consuming what appeared to be a year’s supply of her essential vitamins during our brief encounter. Most of the lower limbs were bare, for we quickly noticed that we were the tallest people there. I sent my daughter to the top of several short trees where she found a large array of huge, sweet rounded ones that no one could reach. I dutifully instructed my child to stuff our bags “to the max” to be sure to get our yen’s worth before leaving to pay. After eating 2 or 3 along the pick, I was ready to leave. (The small isolated outhouse sitting off to the side left me no desire to have any urges from an oversupply of juice). As we set our wares on the stand to give the young lady the pre-figured ¥500 piece, I was surprised to see her place each bag upon a kilogram scale and announce that I owed ¥4,000 ! Now, as a health care provider, I am all for good health and Vitamin C, but there was no way I could justify spending that much for a bunch of tangerines. They instantly began to lose their nice appearance and seemed less orangy as she spoke. I wasn’t sure whether to laugh or cry and short of going back into the field to eat 10 kgs of fruit, I sent my daughter back with a bag while calling out to my friend who accompanied us. I hurriedly gave the lady ¥2,000 and headed to the car. Shortly later, my friend returned with her white 10 kg bag and announced that she had never spent $20.00 on tangerines in her life ! We quickly packed away our stash and sped away. As we passed another stand down the road, I opened the window to ask the price of a pre-packed bag of tangerines. We were told each bag cost 1,000 yen ! We laughed until we cried…most of the way back to Chatan and even now I still chuckle when I think of that lonely bag of tangerines (about 10 kilograms), that’s sitting in a white plastic bag under a short little tree in Motobu just waiting to be picked-----------up.